Negate all other Trap effects on the field. The castle in this card's artwork appears in the artworks of Rock Bombardment, The Huge Revolution is Over and Royal Surrender. The king in this card's artwork also appears in the artworks of Conscription and Imperial Iron Wall. This card's artwork is taken from Yu-Gi-Oh! Duelist - Duel 006, specifically from the panel where Yugi, his friends, and the other preliminary contestants for Duelist Kingdom wait in front of Pegasus Castle for Pegasus to arrive and explain the rules. The battlements were made wider, however. Forgotten Temple of the Deep: "Royal Decree" will negate the effect to treat this card's name as "Umi." Inherited Fortune:" If "Royal Decree" is activated in a Chain to the effect to Special Summon monsters, the effect will still Special Summon the monsters because it is not an effect that activates on the field. Overdoom Line: The text on “Overdoom Line” that destroys itself is not an effect, so “Royal Decree” etc. will not stop it from being destroyed. Psychic Tuning: If “Royal Decree” is activated, the monster targeted by “Psychic Tuning” will no longer be considered a Tuner. However, if “Royal Decree” is destroyed, then the monster will once again be a Tuner. Psychic Tuning: If a monster is Special Summoned with “Psychic Tuning”, and then that monster is destroyed while “Royal Decree” is active (so “Psychic Tuning” remains on the field), then after that “Royal Decree” is destroyed and “Psychic Tuning” is destroyed, “Psychic Tuning” ‘remembers’ the Level of the Special Summoned monster, and you would still take damage based on the monster’s Level when it was Summoned. Reinforce Truth: If the activation of “Reinforce Truth” is negated by “Seven Tools of the Bandit” or “Solemn Judgment” you can still conduct your Battle Phase. If the effect of “Reinforce Truth” is negated by “Royal Decree” you cannot conduct your Battle Phase. Seal of Wickedness: Paying 500 Life Points is a cost, not an effect. It cannot be negated by "Royal Decree". Trap Eater: If “Rivalry of Warlords” is on the field but is being blocked by “Royal Decree”, and you send “Royal Decree” to the Graveyard to Summon “Trap Eater”, the Summon will be successful. However, if you control another Type of monster besides that of “Trap Eater”, then “Trap Eater” will be sent to the Graveyard. You cannot voluntarily send "Royal Decree" to the Graveyard for no reason. A card effect has to remove it from the field. : For "Royal Decree", "Toon World", and other Continuous cards, can you choose to send them to the Graveyard? Normally, for Normal Trap Cards and Counter Trap Cards, after they are activated and resolve they are destroyed and sent to the Graveyard. Continuous Trap Cards with the "Continuous" icon and Trap Cards like "Metalmorph" and "Blast with Chain" which equip themselves to monsters remain face-up on the field after activation. : When activating a Trap Card, does that Trap Card remain on the field? 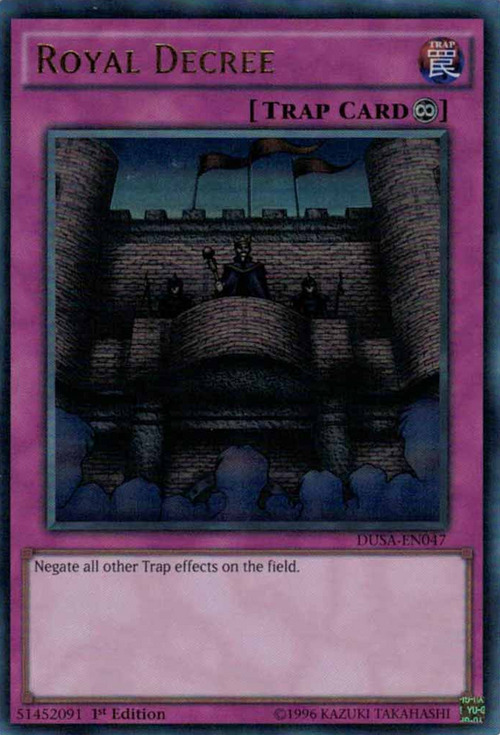 The following cards from before Magic Ruler was released on April 20, 2000 do not have the "Continuous" icon, but during the Duel they are still treated as Continuous Trap Cards: "Ultimate Offering", "Royal Decree", "Magical Thorn", "Robbin' Goblin", "Dragon Capture Jar", and "Call of Darkness". If the activation of "Reinforce Truth" is negated by an effect like "Seven Tools of the Bandit"Magic Jammer", then you can still enter your Battle Phase. If only the effect of "Reinforce Truth" is negated by an effect like "Royal Decree", then you cannot enter your Battle Phase. : Trap Card > Reinforce Truth: Can you perform your Battle Phase when the activation of "Reinforce Truth" is negated by a card like "Magic Jammer"? Imperial Custom: If "Royal Decree" is negating "Imperial Custom", then you still cannot activate a second "Imperial Custom". : While "Imperial Custom" is negated, can a second "Imperial Custom" be activated? Seal of Wickedness: The text "The controller of this card has to pay 500 Life Points during each of your Standby Phases or destroy this card." of "Seal of Wickedness" is a maintenance cost, not an effect. Maintenance Costs cannot be negated, so you still pay the Maintenance Cost even if "Trap Stun" or "Royal Decree" is negating the effect of "Seal of Wickedness". If you choose not to pay the Maintenance Cost in this situation, then "Seal of Wickedness" is still destroyed. : When the effect of "Seal of Wickedness" is negated, is its Maintenance Cost not paid and is it not destroyed? Wild Tornado: Effects like that of "Royal Decree" or "Jinzo" cannot negate the effect of "Wild Tornado" which activates in the Graveyard. : If the effect of "Royal Decree" is being applied, then is the effect of "Wild Tornado" which activates in the Graveyard negated? Limiter Overload: The effect of "Limiter Overload" activates in the Graveyard, so "Jinzo" cannot prevent it from being activated. Neither "Jinzo" nor "Royal Decree" can negate the effect and prevent "Speed Warrior" from being Summoned. : Is the effect of "Limiter Overload" negated when "Jinzo" or "Royal Decree" is on the field? Anti Raigeki: "Anti Raigeki" must be chained directly to "Raigeki". There can be no chain link inbetween the two. Example: Your opponent activates "Raigeki". You chain "Anti Raigeki". Your opponent chains "Royal Decree". You cannot chain a second "Anti Raigeki", since you would be chaining it to "Royal Decree". : Can you activate two "Anti Rageki"s in one chain? Call of the Haunted: After "Call of the Haunted" Special Summons a monster, if "Call of the Haunted" is negated by an effect like "Royal Decree" or "Trap Stun", then the Special Summoned monster remains on the field and is not destroyed. "Call of the Haunted" also remains on the field, even though its effect is negated. If the effect of "Royal Decree" or "Trap Stun" is no longer applied, then the effect of "Call of the Haunted" is re-applied, so the Special Summoned monster would be destroyed if "Call of the Haunted" is removed from the field. : If "Call of the Haunted" is negated by "Royal Decree", then is the monster destroyed? Forgotten Temple of the Deep: If "Forgotten Temple of the Deep" is negated by "Royal Decree" or "Trap Stun", then its effect to treat it as "Umi" will be negated, so that the name of "Forgotten Temple of the Deep" will not be treated as "Umi". : If "Forgotten Temple of the Deep" is negated, then is its card name treated as "Umi"? Pitch-Black Power Stone: If "Pitch-Black Power Stone" is negated by "Royal Decree", then "Pitch-Black Power Stone" will remain on the field meaninglessly. When "Royal Decree" is removed from the field, the effect of "Pitch-Black Power Stone" is reapplied, so you can put Spell Counters on "Pitch-Black Power Stone" by "Apprentice Magician" etc. Pitch-Black Power Stone: The three Spell Counters are placed on "Pitch-Black Power Stone" at activation, before your opponent can respond. If "Royal Decree" is active, the three Spell Counters are still placed on "Pitch-Black Power Stone" at activation. However, the effect of "Pitch-Black Power Stone" will be negated at resolution and the three Spell Counters will be removed. Because of this, you cannot use the effect of "Pitch-Black Power Stone" to move the Spell Counter to another card. : If "Pitch-Black Power Stone" is negated by the effect of "Royal Decree", are Spell Counters placed? Amplifier: You cannot activate a card that would cause an infinite loop because its effect cannot resolve completely. Example #2: you control "Jinzo" equipped with "Amplifier" and "Skill Drain". Your opponent cannot activate "Royal Decree". Destiny Board:" If"Royal Decree" is on the field, "Destiny Board's effect will be negated and you cannot place a Spirit Message on the field. Also if one of the Spirit Messages or "Destiny Board" is destroyed while"Royal Decree" is on the field, the others will NOT be destroyed. If "Jinzo" is destroyed in the End Phase you may activate "Destiny Board"s effect afterwards. Double Snare:" You can destroy "Royal Decree"with this card's effect. Nightmare Wheel:" The effect of "Nightmare Wheel" will be negated by "Royal Decree", so you can attack or change the battle position of the monster. Also, if "Royal Decree" is active, and the monster is removed from the field, "Nightmare Wheel" remains on the field meaninglessly because its text that would destroy it is negated. If "Royal Decree" is later destroyed, the effects of "Nightmare Wheel" are not applied (such as the 500 damage) if there is no monster being targeted by "Nightmare Wheel". Ninjitsu Art of Decoy:" If "Ninjitsu Art of Decoy" is active, then "Royal Decree" is activated and negates "Ninjitsu Art of Decoy"s effect, then "Royal Decree" is later destroyed, "Ninjitsu Art of Decoy"s effect is not re-applied. Scapegoat:" If you activate "Monster Reborn" and your opponent chains "Imperial Order" you can chain "Scapegoat" and "Royal Decree" but only "Scapegoat" will resolve since "Scapegoat" will prevent any Special Summons, and therefore "Monster Reborn" cannot resolve. Spacegate: If "Royal Decree" is chained to the second effect of "Spacegate", "Spacegate's" effect is negated because the effect activated on the field. Spirit of the Pharaoh:" If your opponent chains "Royal Decree" to the effect of "The First Sarcophagus", the effect of Special Summoning is negated and "The First Sarcophagus" is sent to the Graveyard because that is the cost. Talisman of Spell Sealing:" While "Royal Decree" and "Talisman of Spell Sealing" are both active, and "Sealmaster Meisei" is removed from the field, "Talisman of Spell Sealing" stays on the field, but if "Royal Decree"s effect is no longer being applied, "Talisman of Spell Sealing" is destroyed. Trap Monster: vs. “Jinzo“Emodiment of Apophis” is a monster, and “Jinzo” or “Royal Decree” is played, “Embodiment of Apophis” cannot remain as a monster and is placed face-up in the Spell & Trap Card Zone, where it remains on the field meaninglessly (even if “Jinzo” leaves play later). If “Royal Decree” is chained to the activation of “Embodiment of Apophis”, the effect of “Embodiment of Apophis” is negated and it remains on the field in the Spell & Trap Card Zone meaninglessly. Wall of Revealing Light:" If "Wall of Revealing Light"s effect is negated by "Royal Decree"and then that card is destroyed, the effect of "Wall of Revealing Light" is re-applied.